Free Decléor Travel Kit Worth £67.85! with a £85 Spend on Decleor! Get that instant soothing and cooling effect post wax. 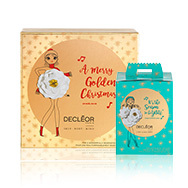 DECLÉOR Gift Sets offer you a selection of your favourite DECLÉOR products and ranges. In luxurious packaged gift sets that are perfect as a treat for yourself and as an introduction to DECLÉOR . DECLÉOR'S range of face care products contain the popular DECLÉOR Cleansing Milk. Alongside many DECLÉOR Treatments designed to purify your skin from the outside down to reveal your skin's natural radiance. DECLÉOR Moisturisers are designed for every skin-type and concern so that you can be rest assured that day or night your skin is being naturally cared for and nourished. DECLÉOR Aromessence Serums & Balms are a collection of natural essential oil-based products. To soothe, balance and soften your skin from face to feet. Select DECLÉOR Aroma Night balms as a gently way to nourish your skin during sleeping hours and wear an Aromessence under your DECLÉOR Face cream for care in the daytime. DECLÉOR Sun products including DECLÉOR Sun Cream offer your skin the protection it needs. When exposed to the glorious, but often damaging and ageing rays of the sun, choose from a variety of SPF factors and after sun treatments to set yourself up for that sunny destination. View all DECLÉOR skin care products in one place. Not sure what you are looking for? Simply select your skin requirement and product type. Our Essential Oils come from carefully selected and sourced renewable plants. They are locally steam-distilled in the finest “terroirs” around the world to preserve ultimate freshness. Each of our Essential Oils is controlled thoroughly to ensure its pharmaceutical quality: origin, botanical and biochemical definitions, chromatography and scent. They are professionally blended by our expert team of aromatherapists, olfactotherapists and scientists to ensure maximum safety. Why double cleansing is essential in your skincare routine. Which aromessence is right for your skin type? We develop formulas that are at least 95% natural. They are tested and approved with consumers under dermatological control for maximum efficacy and sensoriality. Each ingredient, blend and formula is allergy controlled by our toxicologists to minimize the risk of allergy. Essential Oils are the most potent fraction of the top 10% fittest plants in the world. They are the plants’ natural antidote that ensure their protective, regenerative and reproductive properties. Each drop of Essential Oil is a concentration of 150 active molecules in average. Essential Oils have powerful skin and mind properties, including anti-inflammatory, antibacterial, antioxidant, anti-stress benefits*. They are such potent ingredients that they must be extracted and blended with the highest level of expertise.